A family-trained potter at Sam Mui Kuang Pottery, Patsy grew up surrounded by renowned potters including brothers Chua Soo Kim and Chua Soo Khim, and has 22 years of experience at the Dragon Kiln (Hwi Yoh, 1973-1994). She has also learned her skills in Glaze Theory, Pit-firing, Saw-dust Firing and Raku Firing from her brothers. 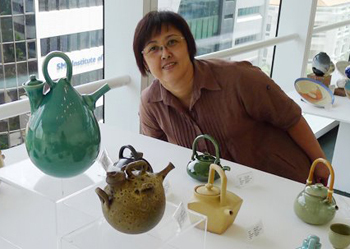 Her specialty is in the creation of dainty teapots and cups, inspired by the art of tea drinking and nature. Her work has been widely received and supported by the Singapore Economic Development Board and art lovers here and abroad. She is currently working as a free-lance potter and a ceramic instructor in schools. 1973 to 1994 Trained and worked at Sam Mui Kuang Pottery in Production Department. 2001 Passages In Art "Inspirations of the Sea"
© Copyright 2011 Sam Mui Kuang Pottery, All Rights Reserved. Redesigned by Lynn Teo. Hosted on Acenet.